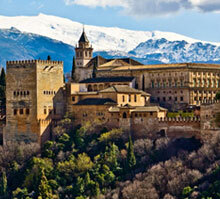 For reasons of conservation and quality of the visit the number of daily tickets to the Alhambra is limited. Tickets are valid only for the day they have been acquired. The hours of access to different areas of the Alhambra will be governed according to the type of input that has been acquired and can be Day (morning or afternoon), or Night. The time of entry to the Nasrid Palaces is printed on the tickets. Such time must be strictly respected, otherwise the right of access is lost to them without appropriate reimbursement of the price paid. When you book one of our Alhambra Guided Tours, on this website, NO NEED TO BUY TICKETS, for our INCLUDING: Tickets and official guided tour. From our website, you can book all kinds of visits.
" Due to the large influx of people, it is advisable to arrive at the monument in advance, especially on weekends and public holidays. The Board of Trustees of the Alhambra and Generalife reserves the right to change this number downwards in accordance with UNESCO's recommendations. " 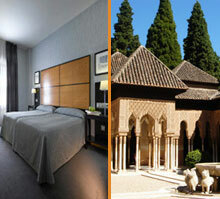 The cultural offer of the Monumental of the Alhambra and the Generalife is wide and varied. You can visit the Alhambra day, daytime general admission, with input option for the morning or evening, and you can also see it at night, for what must purchase the Night Tickets. If you want to visit the gardens, there is the possibility of acquiring an entry that allows to visit the main gardens of the monument, including the Palacio de Generalife. 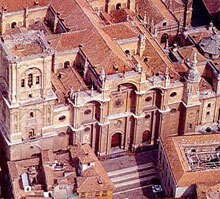 You can also visit the Museum of the Alhambra and the Palace of Carlos V for free. It includes the visitable areas of Alcazaba, Palace of Charles V, Nazari Palaces, Palaces and Generalife Gardens and Bath of the Mosque. This visit also includes the visit of gardens. There will be access to visitable monument areas within the established schedule for the type of input that you purchased (morning, afternoon or night), once inside any of them, you can stay until closing. In the case of Nazari Palaces, you can only access the schedule posted at its entrance. Monday to Sunday: 8:30 to 14:00. Entrance to visit the main gardens of the monument. Except the Palacio de Generalife, which has a maximum capacity, these places do not have controlled access by time passes, being able to make the journey in the space of morning or afternoon as indicated at the entrance. It will also be possible to visit its discretion, the place that has been designated "area of the month" only if it is on the itinerary of this type of input. Walk Cypress, Rainfed, Jardines de San Francisco. Alcazaba: Garden of the Adarves. Partal: Portico of the Palace, Gardens and Walks, Rauda, Palace of Yusuf III, Paseo de las Torres. Generalife palace: Lower Gardens and senior Gardens (Patio de la Acequia, Patio de la Sultana and Water Staircase). 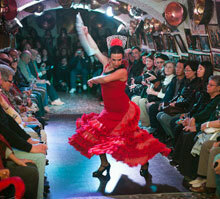 There are two types of nocturnal visit, night visit palaces and gardens nocturnal visit. These visits are independent and incompatible because they are performed at the same time. Friday and Saturday from 20:00 to 21:30 (from November 1 to 28 or 29 February) and Tuesday, Wednesday, Thursday, Friday and Saturday from 22:00 to 23:30 (from March 1 to October 31 ). The itineraries include only spaces adapted to these types of visits for safety and conservation. Please during the night visit not the flash is used because it dazzles other visitors causing discomfort and preventing the serene perception of enlightened itineraries suggestively. Access to the Nasrid Palaces is only the hours indicated on the entry, once inside visitors may remain until the end of the Monument.